About 1.7 percent of children — one in 59 — are now believed to have autism spectrum disorder (ASD), up from an estimated rate of 1.5 percent in 2016, according to data from the U.S. Centers for Disease Control and Prevention. Turns out, another challenge kids with autism have we rarely hear about, is they are extremely sensitive to both oral injections and the sound/vibration of a drill. They often require going to an OR for anesthesia. They may also be hypersensitive to bright lights, loud sound, touch, odors, or taste which can lead to negative dental experiences if ignored. According to the National Institute of Health (NIH), patients with autism have a lower hygiene level. but a comparable caries index compared with patients without autism. Poor oral hygiene and periodontal problems could be related to irregular brushing habits resulting from the difficulties encountered by trainers and parents while brushing these children’s teeth. Biolase technology offers a great solution for these kids. Biolase is a global leader in dental lasers and products that provide biological treatments to reduce pain and improve dental patient safety. I spoke with Sarah Mathias, DDS, MS. She specializes in pediatric dentistry –a distinction held by fewer than 3 percent of all dentists. QUESTION: Welcome Sarah. How does the Waterlase lasers by Biolase work to help children with autism? Waterlase lasers by Biolase are a tremendous tool in the treatment of all children, especially those on the autism spectrum. The biggest barrier to treatment in children, neurotypical and ASD, is the dreaded shot. With laser technology you can eliminate this in almost all pediatric patients. This has been amazing for a lot of ASD patients in my practice because we now have the ability to perform a procedure that would have required general anesthesia in the operating room. Not only are you avoiding the injection, you have a “handpiece” that is emitting a laser beam that is active only when it is approximately 3mm from the treatment area. This is a big advantage from a safety perspective. Children with ASD will often move unexpectedly or very quickly when they are uncomfortable with a situation. This can result in injury to the mouth and face if an operator is using a traditional rotary handpiece (aka The Drill). QUESTION: How do autistic children who have experienced it feel afterwards? They feel normal, which is key for autistic children. Almost all autistic children are uncomfortable with the unknown, especially if they have no way of controlling the environment. By not having to use local anesthesia you are eliminating the feeling of a fat lip after treatment. Because communication can be an issue for children with ASD it is often difficult to explain, let alone convince them that their mouth will return to feeling normal. I have seen many ASD children become extremely agitated after local anesthesia because they cannot handle the feeling of numbness. I have even had patients who after receiving the local anesthetic were so upset by the feeling we were unable to proceed with the appointment. QUESTION: How can parents find out if it’s offered by their dentist? Just ask. Even if your dentist does not have laser technology , they may work with a dentist who does. QUESTION: What if it’s not offered at their local dentist’s office? Biolase.com is a great resource for finding a dentist who offers laser treatment. You can even request an appointment from the website. QUESTION: Anything else parents should know about it? Not only is the Waterlase laser great from a safety and comfort perspective it is actually kinder to the tooth. Lasers do not cause microfractures like traditional handpieces so you’re actually preserving more healthy tooth structure. Lasers can also be used to treat canker sores, perform biopsies, treat periodontal disease and perform frenectomies – all with just topical anesthesia. QUESTION: Where can Dentists go to get it into their practice? QUESTION: Is there a phone number dentists can call to find out more information? Biolase has an amazing training program to help dentists incorporate this technology into their practice. QUESTION: Where can parents get more information? Biolase.com has a section for parents. You can review different treatments that are of interest for your situation, as well as hear some testimonials from patients and parents. QUESTION: Would this help children or teens with severe autism and how? I spoke with a mother of a child with severe autism who says dental visits are a nightmare and it takes 4 dentists to hold her daughter just for a cleaning. As we all know autism is a spectrum. There are varies symptoms and how they are expressed and to what severity is different for every single person living with ASD. I have used the laser with several severely autistic children with various results. Sometimes the noise and water are too overwhelming, but if we can overcome those obstacles we are able to get great results by taking several breaks and eventually completing the restorations. We have also had success with bringing the patient in to see the laser and feel the the water on their hands and hear the sound. This desensitization has helped us to begin introducing the laser into the oral cavity. Although not every patient with severe ASD is able to tolerate treatment with the laser, some are, and if we can keep a child out of the OR for a simple filling that is a success. THANK YOU FOR YOUR TIME AND THIS HELPFUL INFORMATION, SARAH. Autism Spectrum Disorders (ASD) affect 1 in 110 children; and 1 in 70 boys according to Autism Speaks. Individuals with ASD may have difficulties with social situations, communication, and verbal interaction. Consistency is key for developing a long term dental relationship. End each visit on a positive note and build upon the success of every office visit. It may take several visits in order to complete one dental exam. Work with the dentist to find positive solutions for difficult situations. Communication is the cornerstone of a successful first visit. The dentist wants the visit to be a positive one too. Be sure to share medical history and behavioral issues with the dental team. Think about alternatives to drills and shots. Dental lasers are quieter than noisy drills and safer for ASD patients. Finding the right dentist for your child can be a long and tedious process. Look for a dentist that works successfully with ASD patients. Find a doctor who is interested in developing a relationship with your child. The Autism Speaks Resource Guide can help find a dentist in your area. Whirring drills may frighten even the most stoic dental patient, but for children with autism, the noises, bright lights and strong scents of a dental office visit can be a profound, if not traumatic, experience. Now research by Sharon Cermak, professor in the Division of Occupational Science and Occupational Therapy at the Ostrow School of Dentistry of USC, is identifying ways to improve the dental experience for children with autism. Such distressing experiences are common. According to a 2010 survey of nearly 400 parents of children with autism, almost two-thirds reported “moderate to extreme” difficulty with oral cleaning at the dental office. While a typically developing child can usually adapt to sensory stimuli, many children with autism process sensation atypically. That processing can manifest as behaviors ranging from physical withdrawal to self-stimulation, outbursts and tantrums. Because many dentists simply aren’t equipped to deal with such challenging behaviors, they often use sedation or restraint. A 2012 study published in Pediatric Dentistry by a team of USC researchers found that 18 percent of parents of children with autism reported the use of restraint “often” or “almost always” during dental visits, while nearly 40 percent reported the use of pharmacological methods such as general anesthesia to complete routine cleaning. 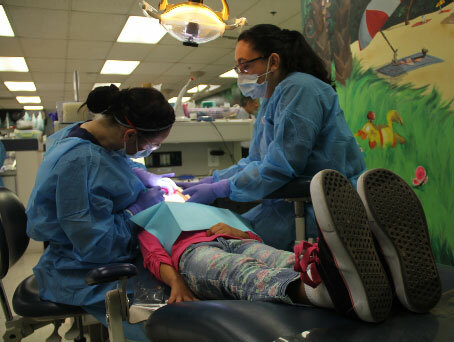 Cermak’s study of “Sensory Adapted Dental Environments,” funded by the National Institute of Dental and Craniofacial Research and conducted with the Ostrow School and Children’s Hospital Los Angeles, is studying how adaptations to the dental office can create a more manageable experience. By replacing fluorescent lights with softer and colored lighting, playing soothing music and using butterfly wraps that provide calming deep pressure, Cermak’s research aims to decrease levels of anxiety and negative behaviors among children with autism. Improving the experience and quality of oral care within this population is especially critical in light of recent statistics suggesting that the number of children with autism is rising. The Centers for Disease Control and Prevention released a new estimate that 1 in 68 children in the United States are identified with autism spectrum disorder, roughly 30 percent higher than the previous estimate of 1 in 88 children. Preliminary findings from Cermak’s study are positive. Children in the sensory adapted dental environment were less anxious, and fewer people were needed to help restrain children during cleanings compared to ordinary dental offices. “As crucial as oral care is to overall health and wellness, finding a way to help both dentists and their patients has to be a priority,” Cermak said. Biolase is a global leader in dental lasers and products that provide biological treatments to reduce pain and improve dental patient safety. These gentle treatments are especially helpful for kids with autism. Enter Your Zipcode To Find a Biolase Dentist Near You! Dental Health Links To Overall Health. We Recommend Biolase For Everyone. My name is Maria Dorfner. I'm the founder of NewsMD Communications and most recently, Healthy Within Network (HWN). This is my blog to help people get and stay healthy.